When I opened Facebook and saw the video of that Hartford Whalers jersey with "Brass Bonanza" blaring, it was pretty clear that the Carolina Hurricanes had lived up to the speculation and planned to honor its past: one that still causes heartache for many over 600 miles away. My initial reaction to the video was excitement. I'm a sucker for nostalgia like many. When the Penguins brought back their "Pittsburgh gold" jersey as an alternate in 2014, I loved it despite being just a baby when they last wore them in 1992. Two years later, they became the main home jersey with a white road jersey to match. If there is one professional sports league in North America that has embraced looks of the past, its the National Hockey League. Third jerseys have helped many teams shed the tacky looks of the 90s and return to a cleaner, classic look. The Carolina Hurricanes throwback jersey is a nice gesture and acknowledges the franchises origins, but for those in Hartford and other parts of New England that followed the team and watched it move south in 1997, it can feel like the Canes new ownership is digging up a coffin and propping up the corpse for two games in order to sell merchandise with the logo of a team who many will argue died over two decades ago. The comments on Facebook and the replies on Twitter vary from those who love it, those who feel the Hurricanes had no right resurrect the look and others telling that second group to get over it. I decided to temper my excitement with sympathy for those who had their hearts broken in 1997. When the Penguins future in Pittsburgh was unknown in the early and mid 2000s, thinking they would move to a place like Kansas City or Las Vegas left me in a depressive state with every news report that hinted they might leave. In the end, the team got a new arena and a 30 year lease, but what if it went the other way? What if the Penguins moved to Kansas City, were re-branded and 20 years after leaving, their owner decides they will wear Pittsburgh Penguins "throwbacks" in games against the Flyers? That's a timeline I'd rather not venture down, but perhaps I would react negatively. I would be the type of Penguins fan who hangs on to jerseys, t-shirts, hats and other items with the hope the NHL can reincarnate the team like the NFL re-established the Cleveland Browns after the original Browns moved to Baltimore. I would probably be irritated that some owner is trying to generate revenue by selling merchandise with that iconic skating Penguin that went extinct when they moved to the middle of the country. So...yeah. 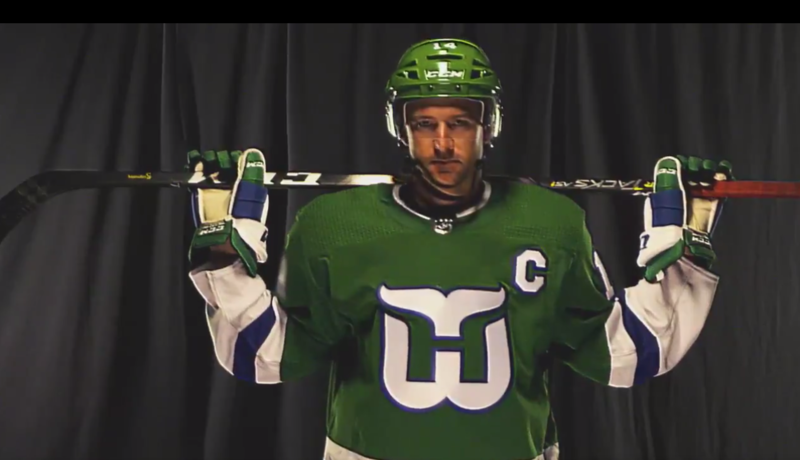 I get the pain Whalers fans might feel when they see the Hurricanes in those amazing, all-green throwbacks. Even with that pain, I would imagine there were some tears while "Brass Bonanza" played as the camera panned over every inch of the jersey. And just because, here's what might be the best theme song for a team in any professional sport! And here's the final game the Whalers played in Hartford. Under Armour has "Frankensteined" the latest Notre Dame "Shamrock Series" uniform for the annual game being played against Syracuse at Yankee Stadium on November 17. 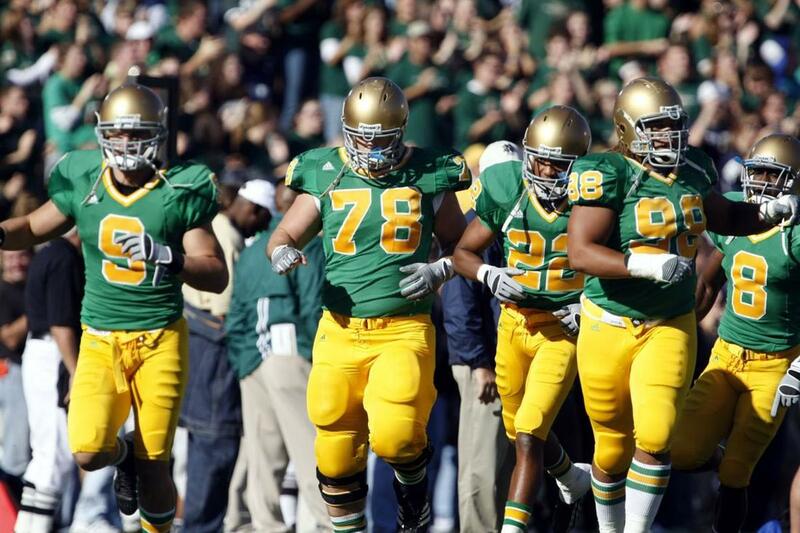 These specialty uniforms have been hit or miss since Adidas, Notre Dame's former outfitter, came up with a whole new look for the 2012 game. We've seen all-white, all-green, colors that made 2016's uniform look like something Baylor would wear (a season where you didn't want to look like Baylor) and helmet designs that wowed and made us go "meh" at times. Even if they strayed away from the norm, you still knew it was Notre Dame. But this season's uniform, without very little comparisons to past looks, is the worst. Like every uniform unveiling in college football, we got a quick first look in a video. At first glance, no gold helmet. That's a problem for me. It is the main reason the 2012 look didn't appeal to me. Second, the "Notre Dame" in the New York Yankees font. That should have been a clear giveaway something bad was on the horizon. Then we get a profile view as our model exits the Subway in the Bronx. By the way, totally unrealistic. If that was truly the New York City subway system, he'd be elbowing hipsters and upper west siders who missed their stop. It's hard to see the pinstripes on the sleeves and pants, but yep! Dr. Frankenstein at Under Armour took two of the most recognizable (and for many, insufferable) teams in North American sports and combined them to make this. □☘️ When @NDFootball battles Syracuse at Yankee Stadium on November 17, the Irish will add some @Yankees flair. Now, if you're both a New York Yankees fan and a Notre Dame football fan, you probably really like this, which is cool. If Notre Dame played a game at Heinz Field and paid homage to the Steelers with some of that uniform's design, I'd probably be writing something different. But the Yankees are such an easy target. When I saw the uniform for the first time, I had that same feeling when a relative posts a picture of a fake John Lennon quote to justify why they voted for Donald Trump: I'm amazed by the shortsightedness. It will probably sell well in the New York market and boxes of these will probably sit in storage in Boston (way to alienate that part of your fan base, Notre Dame). So if anyone from Under Armour happens to read this, make a modern uniform of this look for next year's game and you might get more of my money. Seriously. How can you not like this look? The 2007 team that last wore them didn't deserve to, but look at these! If Under Armour made this for 2019 and never made another uniform, I would be content. Regardless, the Notre Dame Yankees will either be in the College Football Playoff mix come November 17 or I will be many of the fans parroting that Brian Kelly can't win in the most crucial month of the season. I can't lie. Over the last few days, I have had, what you might call, "Cup envy" as the Capitals have partied in Las Vegas, the streets of Washington D.C. and on the "Tonight Show" with the Stanley Cup. Not because they won (my Penguins won the last two before this season), but because they're having the kind of fun our society accepts when a professional sports team wins a championship. For the Capital players, they are athletes who train year-round, play 82 regular season games and then must play two more months of hockey to win the title. You can't blame them for trading in the protein shakes for beers and champagne after winning it all. Everyone's spirit animal since Thursday night has been captain Alexander Ovechkin. For 13 years, Ovechkin has been one of the best players of his era but could lacked something his counterparts, fellow Russian Evegni Malkin and Sidney Crosby had: a Stanley Cup. 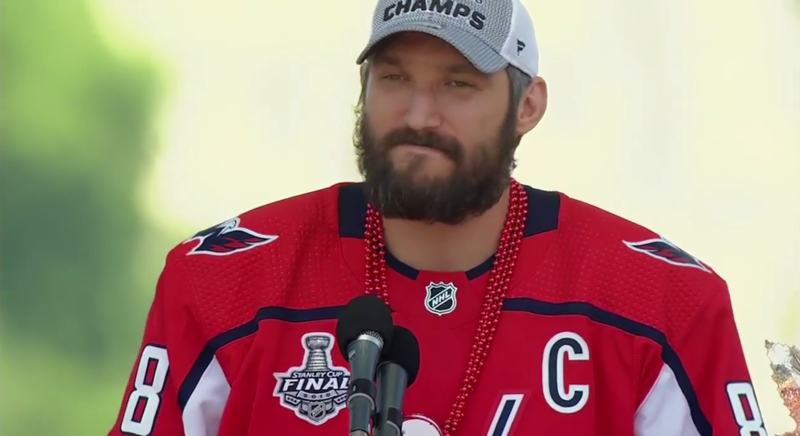 From the moment he eagerly ripped the Cup from commissioner Gary Bettman and lifted it for the first time, Ovechkin has partied like the 18th Amendment was soon making a comeback. You're envious when you see Ovechkin among fans at Georgetown doing a keg stand with the Stanley Cup and partying in the fountain with teammate. When he goes to the Nationals baseball game and randomly lifts the trophy gameplay, not caring about the action on the field, you're envious. Working with an accent and a high blood-alcohol content, he ends the parade with a fragmented sentence while throwing in an F-bomb that keeps it together. The envy returns when the crowd on the National Mall responds with a huge roar and he once again raises the Stanley Cup with the U.S. Capitol in the background (just out of curiosity: was this crowd bigger than Trump's inauguration crowd?). Now, Ovechkin will have to come down from 'hockey nirvana" at some point and start acting like a normal, functioning adult again, but like many before him, he has earned the hall pass to act like an idiot and do things, that for the rest of us, could leave us unemployed and with a public drunkenness on our record. It's been fun to watch Ovechkin the last couple of days. You hate him when he plays against your team, but you would give something up to have the last five days of his life. Party on, Ovi. Safe to say that Olli Maatta's partying at the Penguins 2017 parade has been outdone. The long-suffering Washington Capitals finally won a Stanley Cup Thursday night in Las Vegas. In house at T-Mobile Arena was Vegas Golden Knights general manager George McPhee, who watched Alexander Ovechkin, a player he drafted 14 years ago while working the same job in Washington, lift the trophy, exercising playoff demons of the past, ones that cost him his job in 2014. If anything, McPhee is named general manager of the year after putting together an expansion team that reached the Stanley Cup Final, but glancing over at the opposite bench, many of the players who made an impact in Washington's title run were McPhee selections. Ovechkin (2004), Nicklas Backstrom (2006), John Carlson and Braden Holtby (2008), Dmitri Orlov (2009), Evgeny Kuznetsov (2010) and Tom Wilson (2012) were names heard throughout the spring. This is not a slight to current general manager Brian MacLellan, who brought in T.J Oshie and Devante Smith-Pelly, two other big contributors during the Stanley Cup run, but the core was built by McPhee. Like most general managers, he had to take the brunt of the blame for the team's continued lack of postseason success as he and then head coach Adam Oates got pick slips in 2014. Now, some of you probably read the headline, rolled your eyes and said I'm a millennial who thinks everyone should get a trophy. Well, I'm not. Giving McPhee a ring would be odd, but it would be a nice, unique gesture. At the very least, Capitals owner Ted Leonsis could send him a thank you note. Either way, George McPhee should be proud of his past and current work as a National Hockey League general manager. So...who had Winnipeg-Vegas in the Western Conference Finals when the season began? How about when the Stanley Cup Playoffs started? Regardless, this is an intriguing matchup on several levels. Entering the playoffs back in April, neither the Winnipeg Jets nor the Vegas Golden Knights had won a playoff game. Before this spring, the Jets had qualified for the playoffs twice in their history (2007 when they were the Thrasher and 2015 in Winnipeg) and were swept in both series. The Jets disposed of Minnesota in five game and dethroned last season's Western Conference champion, the Nashville Predators, in on the road in Game 7 5-1. The Golden Knights, who in its expansion year continues to exceed expectations, not only won their first-ever playoff game but swept the Los Angeles Kings in the process and then beat the San Jose Sharks, a team that was just in the Stanley Cup Final two seasons ago, in six games. In this Western Conference Final, it features two markets with different climates but both are in uncharted territory. Winnipeg, which has a metro population of under 800,000 is the NHL's equivalent of Green Bay and the Packers. Canadians live and breath hockey. Winnipeg fans are no different. It's a fanbase that perfected the "whiteout", never saw their team make it further than the second round the first time around and suffered 15 years without an NHL team when the original Jets departed for Arizona. With these Jets (who flew away from Atlanta in 2011), they proved they could win "a" game in the playoffs and win a series, which exorcises those demons that made it through customs when the Thrashers relocated. Blake Wheeler, a carry-over from the Thrasher years, had 91 points (23 goals, 68 assists) this season for Winnipeg. He may not be a household name like Crosby and Ovechkin are in the United State but he's a rock star in Manitoba. Patrick Laine, the team's first round pick taken second overall in 2016, led the team in goals (44) this season. The Jets have finally given outsiders something other than the snow and cold to talk about when Winnipeg comes up. When it comes to Vegas, I have stopped saying "The Golden Knights can't do this!" and "No way the Golden Knights can possibly do that!" ever since their inaugural season began in October. While past expansion teams struggle in their first year and develop younger players around veterans picked up in the expansion draft, the Golden Knights broke away from tradition. Not only did they post a winning record, but they won their division and cruised through the first round and in round two, beat the Sharks in six games. The Golden Knights are not a normal expansion team. They are the first in the NHL's salary cap era and had the chance to grab some pretty good veterans in the expansion draft. A three-time Stanley Cup champion goalie in Marc-Andre Fleury and others like James Neal, Derek Engelland and William Karlsson. Karlsson is a 40-plus goal scorer and Jonathon Marchessault joins him in the 70-plus point club. David Perron, another veteran player grabbed by the Golden Knights in the expansion draft, had 50 assists this season. For the first time since 2009, the Stanley Cup champion will be a team that is not the Penguins (2009, 2016, 2017), Blackhawks (2010, 2013, 2015), Kings (2012, 2014) or Bruins (2011). As someone who screams about the lack of parity in the NBA Playoffs (another Cavs-Warriors Finals is in the works there), we're finally getting it in the 2018 Stanley Cup Playoffs and it's good parity! The only team left that has smelled the Stanley Cup Final in the last decade are the Tampa Bay Lightning, who lost to the Blackhawks in 2015. The other three are in new waters. The Washington Capitals were finally able to beat the Pittsburgh Penguins in the second round and will try to make the Final for the first time since 1998 and win their first Stanley Cup. Washington physicality and Tampa's speed should make for an exciting East Final, but the more intriguing of two series has to be Vegas-Winnipeg. It may not be the best series for TV ratings in the U.S. but the Vegas storyline will keep normal fans watching and those who stroll in at playoff time popping in and out. Expect all of Canada to get behind Winnipeg. That country hasn't had a summer with the Stanley Cup since 1993. If the team from the west takes the Stanley Cup this season, it's a huge first for that team, especially Vegas. It's not uncommon to be flipping through channels on a Saturday and seeing lots of movies, especially comedies that have aged well after a decade or two. Last weekend, Comedy Central was playing a few of them. First, Billy Madison, Sandler's first feature film (when Sandler's style of comedy was liked) and in-between another well-known (and liked) Sandler film, Happy Gilmore, was Tommy Boy. The 1995 movie, starring Chris Farley and David Spade, is a cult classic. It's one of the few movies I can grab a random quote from, and use in a conversation, usually to make a joke. When that person or persons gets the reference and laughs, it's worth it. Now, that airing of Tommy Boy was on December 9, which made me think to when Farley died at the age of 33. Farley's death came on December 18, 1997: 20 years ago today. The comedian, who once sang "I'm a clown, but I cry" on Late Night with Conan O'Brien, was an incredible comedic and physical talent whose demons led to his accidental overdose in Chicago. Of all the movies he did in his short life, Tommy Boy remains my favorite and I would imagine many others feel the same way. I was 12 or 13 when I first saw Tommy Boy. My dad had it on VHS (it was circa 2001 or 2002 so VCR's were still around). But my love of the movie grew as I got a little older. Every year since the mid 1980s, my dad, his brothers and my grandfather have traveled out to South Bend, Indiana for a Notre Dame football game. My grandfather, who is now 94, owned one of those old Dodge Ram vans that featured the wood paneling, nice roomy seats and a television with the antenna and VCR. After Tommy Boy came out, the movie joined the catalog of movies they would watch during the long car ride from Pennsylvania. As I got older, I started going on the trip and a few of my cousins started going, too when the Dodge Ram van was still around. I still remember the first time Tommy Boy was put in the VCR. It felt like a weird right-of-passage. Also, if you travel from Pittsburgh to South Bend, you pass the exit for Sandusky, Ohio, so everyone got a kick out of that a few hours into the trip. So why do I like this movie so much and why I am I dwelling on it 20 years to the day its star died far too young? When I think of Chris Farley, I like to think Tommy Callahan III (along with his "Chris Farley Show' SNL sketch) was the character most like the real Farley: a "people-person" with faults, but would sacrifice everything for others. It's the old cliche of "the lovable loser", but its a character most can relate to, and I want to believe Tommy was a reflection of Farley. Not to sound sappy, but the family aspect of the movie where Tommy wants to make his dad proud after his death and keep Callahan Auto hits home for me as a guy who comes from a big Irish family on my dad's side. We probably see him play Fatty Arbuckle in a biopic, voice Shrek and star in a few of the Sandler movies that have come out in the last 20 years (and maybe make them a little better). I'm just glad Tommy Boy was a thing and will always be my best memory of Chris Farley. "The Original Brake Pad Pitch"
I learned this whole scene after the watching the movie a few times. I don't know what's funnier: When he lights the model on fire, or when he goes "here comes the meat wagon" and starts making the alien siren sound. At that point, Richard and the guy they're trying to sell to looked shocked. I would imagine it took a few takes for everyone to keep a straight face. Honorable Mention: Tommy asking to have parking validated after being kicked out. I have come upon blown out truck tires while driving, and I always think about how Callahan brake pads would keep me safe. The only scene with Farley and Rob Lowe together. Also, before they go cow tipping, Tommy said one thing they could do in Sandusky is "go to the livestock auction and cruise the 4-H babes". A bit originally done by Farley for Spade in their SNL office, this might be the most memorable moment from the film. The outtake from the blooper is just as funny when Farley cant get the jacket to rip. What was the turning point of the film, Richard realizes Tommy is a "people person" type of salesman after convincing a waitress to make chicken wings in a pitch of self-loathing. "Your sail is limp, like your d***!" Kids are the worst. Especially in this scene. We got from Big Tom's funeral and Farley walking alone and sitting on the loading dock at the auto plant, contemplating what will come next. This scene is a good way to remind you that it's still a comedy. The kids hurl every insult at Tommy until he finally snaps and threatens them, and as kids their age, they don't take him seriously, until Michelle puts the fear of God into them. Definitely unexpected when you watch it the first time. A nice way for the movie to end. Tommy sitting in his boat, talking to his father having a nice moment. He gets the wind for his sail, and it also happens to hit him right in the back of the head. With ten months to go before the 2018 Winter Olympics in PyeongChang, the National Hockey League announced Monday they won't send players to the games next February. It screams of the old "Owners vs. Players" that every league has. The NHL itself has had three lockouts in the last 20 years, one of which resulted in the loss of the entire 2004-05 season. The NHL's decision to hold players out is unfortunate for players who want to represent their country in what is one of the biggest international tournaments for hockey. Players like Washington Capitals captain Alexander Ovechkin expressed their desire to play in future Olympics with the hope of winning a gold medal, something his adversary, Penguins captain Sidney Crosby, has two of. The Olympics in South Korea would have marked 20 years since the NHL sent its players to Nagano, the first of five consecutive winter games. Initial anger and resentment towards the NHL was expected, but you can't put all the blame on the league for their decision. The corrupt International Olympic Committee is also to blame. The IOC has garnered a bad reputation over the years. It's a group that has a ridiculous list of demands for cities to host the games, and most of the time, leaves host cities in economic disarray after the two weeks of Olympic action. These things made it hard for them to find a proper host for the 2022 Winter Olympics. When ideal candidates like Oslo, Norway and Stockholm, Sweden pulled and cancelled their bids, and were left with Beijing and Almaty in Kazakhstan. They went with Beijing, who held the summer games in 2008 and are not an ideal spot for a winter Olympic. While they are great at listing their outlandish demands, the IOC could not find common ground for the NHL, who did not appear willing to shut down operations for two weeks and give in to the committee. When the dust settles, neither side comes out clean. The I.O.C. wreaks of the sewage that wound up in the waters in Rio and the NHL will be viewed as a league that continues to trip over itself. If the public were Olympic judges, nobody makes the podium in this situation. The NHL has groundwork with the World Cup of Hockey and amateurs will once again have the chance to play in the Olympics.